First things first! Back by popular demand, we’ve got our farm calendar ready. $12, free shipping anywhere. I’m putting it around locally as well in four little country stores near us. It’s a tiny piece of income for us at a time of year without much income, so thanks very much. We hope you enjoy it as much as previous ones. The cover is my favorite photo from last year, my naughty guilty geese, coming back up the hill after an adventure across the street where the snow was melting into a puddle. They so love water, and my wading pools have a hard time competing with standing water. We included every type of critter we have, and made sure to include Bjarki-boy, who we lost this summer and miss so much. For the fourteenth year in a row, we’ve joined Holidailies again this year, and will be updating the journal every day for the month of December. I’ve been here since the beginning, back when a web journal was new and wonderful. I always make turkey tetrazzini with turkey leftovers. It’s a tradition. I’ve changed it up quite a bit over the years. This year, I went all out, and it came out super special. I used wild mushrooms that we foraged ourselves and dried in the dehydrator. I used raw milk from pastured cows. I used our own pastured heritage turkeys, of course. I cooked things in duck fat, too, because I had some on hand and why not?! I also used a special salt this year, Omnivore Salt, a kickstarter thing that Michael Pollan recommended and we just received. I wanted to try it on something before adding it to the pot of turkey stock I had simmering to make sure I would like it. It’s finer than the Kosher salt I’ve been using, but it is absolutely delightful and added something really special. So who knows what kicked the tetrazzini into extra awesome, but it was. We were hoping to have enough to freeze some, but it looks like we are going to go through the entire batch before today is over. It’s that good! So, rehydrate a couple of handfuls of dried wild mushrooms in a cup of boiling water and half a bottle of white wine. 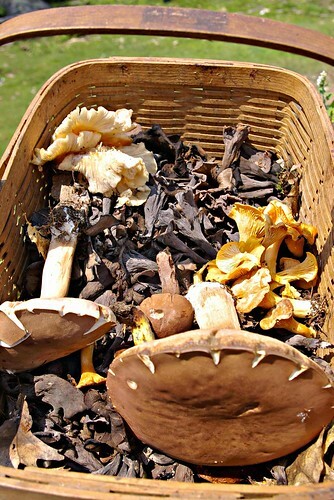 I used Reisling as the wine and chanterelles, oysters, and black trumpets for the wild mushrooms. Most years I use a Gewürztraminer because that’s the only white wine I like, but Frank couldn’t find a bottle of that this year, and the Reisling worked out fine. It was a little sweeter than usual, but I think the fancy salt countered it nicely. Make a slurry with 3 tablespoons freshly ground local flour (I love saying that, now that I work for Green Mountain Flour. But seriously. How often can you get local grains, freshly milled? I have the best job ever.) and 2 cups raw milk. Add back the mushroom liquid, bring to a boil, add the slurry, stir well, then turn it down to a simmer. I confess that it didn’t thicken up quite enough, but I do that on purpose so that I can add some left-over gravy. I like that flavor and I like to use it up! Add a package of frozen peas to the noodles about half way through cooking. Drain noodles, put back into the pot, add mushroom goop. Stir in the cheese, saving some for the top. 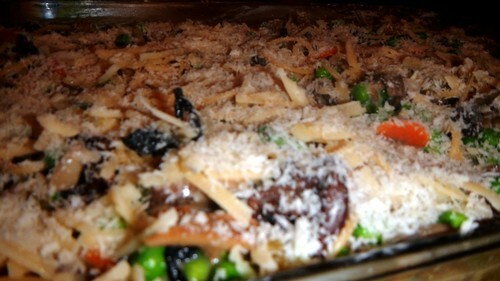 Pour all into a buttered casserole dish, then add the remaining cheese on top, and the bread crumbs. Bake at 350 until it’s nicely bubbly and browned on top, about 45 minutes. Anyway … yum! I read somewhere that some people put olives and cream cheese in it, and I just can’t even consider that. Peas, carrots, celery, mushrooms. There ought to be a law! With the other dairy, I could possibly handle cream cheese, but olives would be horrid. Yum, what time is dinner? ?